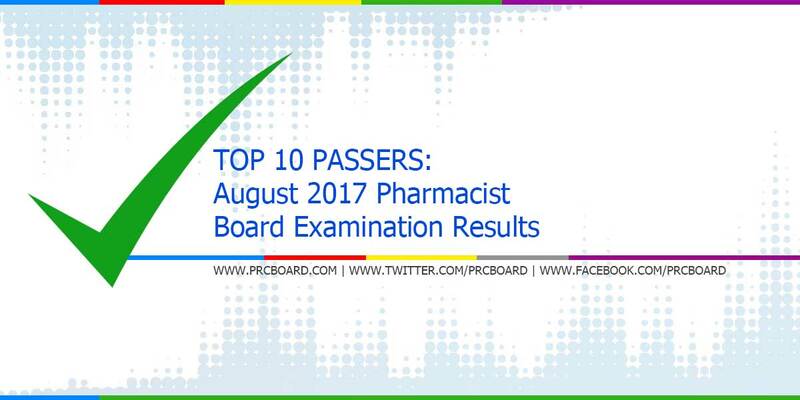 The 'August 2017 Pharmacist board exam results', conducted by PRC’s Board of Pharmacy are released two (2) working days after the last day of board examination. Aside from the official list of passers, top 10 examinees, top performing schools and performance of schools are also posted. Below is the complete list of Pharmacist top examinees, courtesy of PRC. While most examinees are asking about the possible release date, as mentioned in the main page of this article, it will be out by September 5, 2017 (Tuesday). Meanwhile, the specified date is just target/ estimated timeline, results may be released earlier or later without prior notice. Maybe it's not for you, try mo hanapin yung gusto mo talaga gawin in your life. If the answer is still being a pharmacist, then aral ka pa twice harder sa susunod na exams. Try mo din magsearch ng tips on how to pass the boards. The exam is tricky but not impossible, may mga few questions na talagang "saan galing yun" but don't lose hope. You can be successful with or without the license. Nasa tao pa rin talaga yan. Goodluck! Quite disappointed. CEU didn't make it to the top 10. But kudos to all Escolarian passers! !